Catherine Louise Sagal (born January 19, 1954) is an American actress and singer-songwriter. 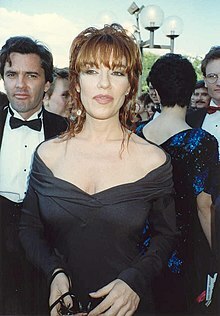 She is best known for her role as Peggy Bundy, Al‘s sarcastic, lazy, bon bon-eating wife, on Married… with Children and for her role voicing the character Leela on the animated science-fiction series Futurama from 1999 to 2003 and 2008 to 2013, as well as for starring on the show 8 Simple Rules in the role of Cate Hennessy. In the latter role, she worked with John Ritter until his death, leading to Sagal’s taking over as the series lead for the remainder of the show’s run. Sagal has been married to Sons of Anarchy creator Kurt Sutter since 2004. Currently, Sagal is a series regular on the CBS television show Superior Donuts.